Its probably a result of too many childhood afternoons in front of Saturday matinee movies, I love being transported to another place and time. I loved (and still love) the glamour of musicals, one of my favourite movies of all time is Singing in the Rain - which I know all the words to and annoyingly act out the movie every time its on. My favourite movie of all time is Some like it Hot. Not only is it one of the funniest movies but it also stars my Marilyn. I don't know when I started to love Marilyn. Was it because she appeared like a glamorous doll on the television? Was it the sparkly clothes and immaculate look? Is it because she and I share the same star sign? Marilyn is no doubt an icon, her image is easily recognised and frequently copied, but never equalled. She is a magical mix of being both seductive and innocent at the same time. Marilyn is the kind of woman that men long to protect and women want to be. There is nothing threatening or overbearing about her. 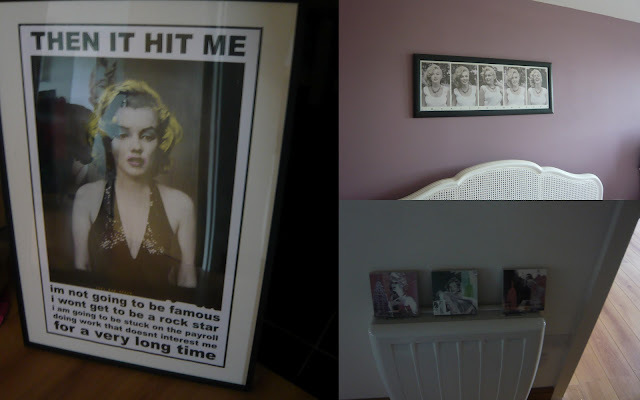 Since I have been a big fan of Marilyn's I have collected a lot of Marilyn memorabilia. Since it's her birthday today I thought I would share it with you. I really would recommend reading some books on Marilyn - she really faced adversity to become a star and led a tragic life. 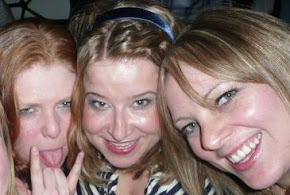 I wonder if she was born today would her life have been vastly different. She was born out of wedlock to a mother who not only had mental problems but who's family had a history of mental problems. Abandoned by her mother and put into foster care, she got married at 16 to avoid going into an orphanage. Talk about the odds being stacked against you. 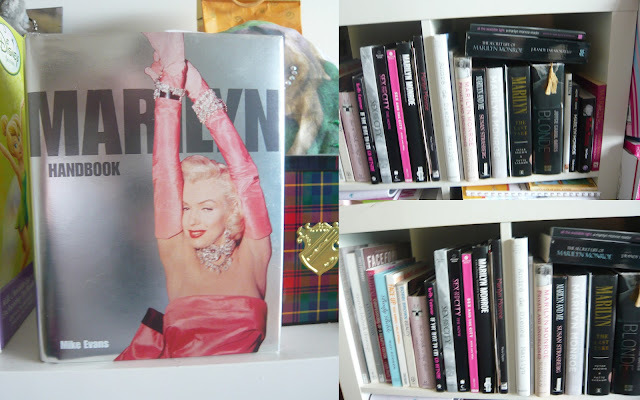 I have read most of the books that have been published about Marilyn and its really interesting to read different peoples understanding of her. You also find out interesting things like Truman Capote wanted Marilyn to play Holly Golightly in Breakfast at Tiffany's. There is not a room in my apartment that doesn't have a touch of Marilyn from my (never used) apron to my Marilyn mugs. My prize possessions are my Hotel del Coronado plastic cups that I robbed when I visited it a number of years ago. If you're familiar with Some Like it Hot you might know that Hotel Del Coronado is where the movie was filmed. I know it was a bit cheeky of me to take the plastic cup but I bought a hot chocolate which cost about $15.00 so who was robbing who really? When I was in the hotel I also picked up a wonderful mug with Marilyn on the beach outside the hotel. 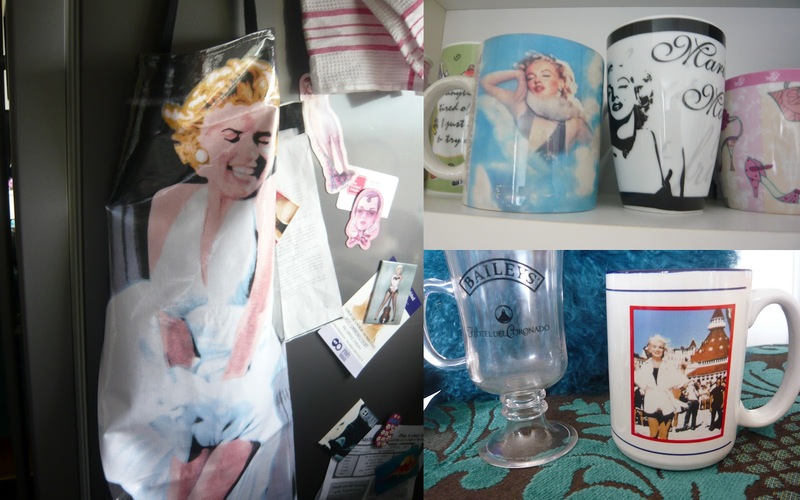 (I have quite a few Marilyn mugs cause I love tea mmmm and I also like to collect mugs from places that I have visited). 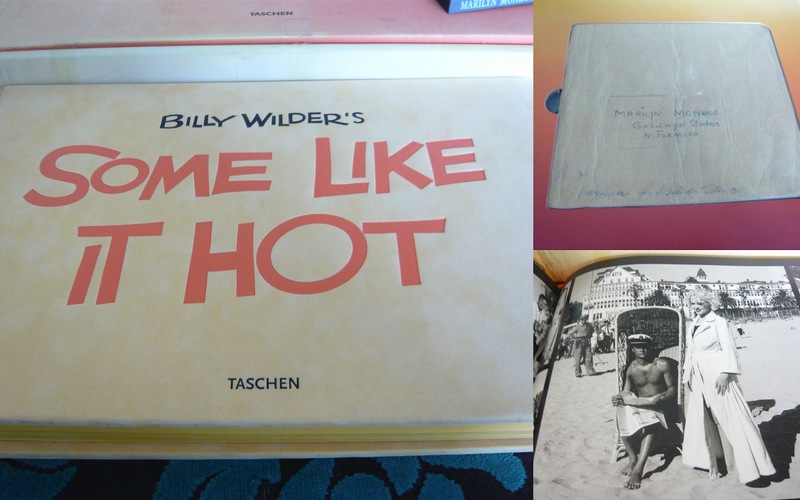 When we were in the Hotel Del Coronado my (most excellent) bro bought me a collectors book on Some Like it Hot. The book has the story behind the making of the movie with behind the scenes pictures and even contains a copy of Marilyn's script with her notes. It is one of my prize possessions. I have a good few posters/artwork around the place. From the sublime to the ridiculous, I have a Marilyn wobbly head (boo boo be do) and a Marilyn screen that dominates a corner in the living room. 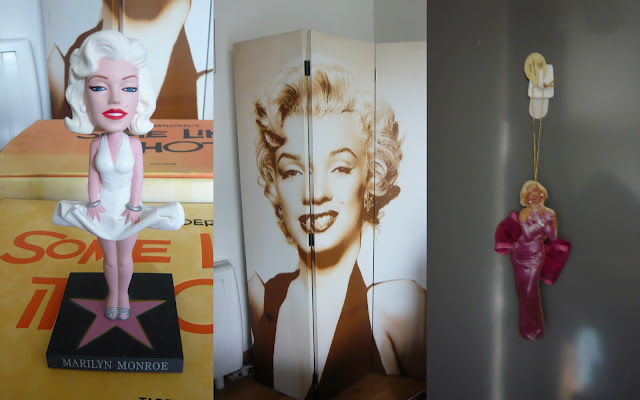 I know I am not alone in my love for Marilyn, do you love Marilyn or are you more of an Audrey type of girl. From one Gemini to another Happy Birthday Marilyn.